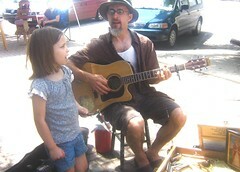 I have been doing some busking this summer down at the farmer's market in our neighborhood. Dove got into the act with me this past weekend. She is a natural and pretty fearless. I have a suitcase filled with homade instruments I take with me. I have some shakers, flutes and a washtub bass. I am trying to learn how to play other things beside the guitar and making simple music items seems like a good way to enter into some new sounds. I have always loved the experience of making art on the street in a humble doit yourself way.